Supplementary material reads: "Description: L. A. Conservatory Opera Anniversary party. 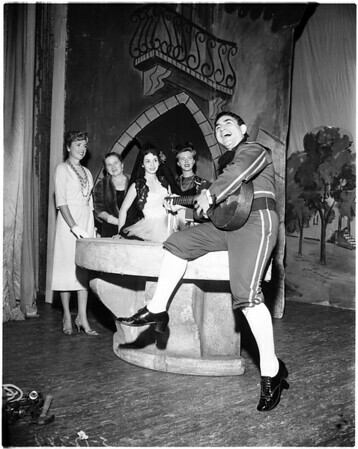 L to R Mrs. Byron Tefft, Mrs. E. Herbert Herlihy, 'Rosina' Patricia Burkey, Mrs. Richard von Hagan, 'Figaro' Michael Andoor. L. A. Conservatory Opera party L to R Mrs. E. Herbert Herliny, Mrs. Byron Tefft, 'Prima Donna' Patricia Burkey. Rothschild News Photos 625 So. Western Ave. Los Angeles 5 DUnkirk [sic] 7-2284".